Espacio Fundación Telefónica hosts the legacy of more than a century of informative and exploratory activity by National Geographic through this sample with iconic objects, photographs, maps, and videos, some never before seen in Spain. Protecting the environment has become the most important crossroad of our time. Our existence depends on the conservation of the planet. Therefore, research projects whose purpose is to guarantee this survival are the key to our future as a species. 130 years ago, an identical desire to learn about our environment in order to improve it brought together 33 scholars including natural scientists, geographers, cartographers, educators, lawyers, and soldiers, in order to create an entity, which would contribute to extending the boundaries of knowledge of geography. Thus was born the National Geographic Society, founded on 27 January 1888, a cold day in Washington D.C., by this heterogeneous group of wise men, which included philanthropist Gardiner Greene Hubbard, the first president of the Society, and his son-in-law, British inventor, scientist, and speech therapist Alexander Graham Bell who succeeded him as president. Since then, National Geographic has become the most important non-profit institution in the world, and an absolute reference when it comes to exploration and research. Under the protection of its iconic yellow frame, in the last century and a half the National Geographic Society has supported the careers of scientists and researchers from all around the world. Figures such as North Pole explorer Robert E. Peary, or the man who discovered the city of Machu Picchu, Hiram Bingham, as well as figures closer to our contemporary period. This is the case of the primatologists Jane Goodall and Dian Fossey; Robert Ballard, the oceanographer and marine archaeologist who discovered the remains of the Titanic; the film-maker James Cameron, the Spanish marine biologist Enric Sala, or the most recent winner of the 2018 Princess of Asturias Award, the marine biologist Sylvia Earle. A window to the world. 130 years of NG shows us not only the history of Society and its legacy, but also the evolution of an institution that has been capable of adapting to the times, and varying the definition of its main missions according to the demands of these times. Although at the beginning, the goal of the 33 founders was to explore the geography of the world and search for places that were still unknown to man, challenges have varied with time to accommodate other priorities. Geography has given way to the exploration of other worlds: space, with articles and documentaries about NASA missions and unknown universes such as Mars, and the oceans, the current last frontier, source of life from the beginning of our planet, and one of the main conservation missions in order to guarantee the survival of our species. In words of Sylvia Earle, “No Green without Blue”, in reference to how much we depend on the sustainability of the seabed in order to regain the environmental balance. Through photographs, videos, and iconic items, the exhibition delves into these issues, presented in five sections, through which we will learn more about its early days, but especially about its present and future of National Geographic, its missions, and their meaning. Visitors will begin their journey in Terra Incognita, where we celebrate the birth of the Society and the age of expeditions. In Origin, visitors will learn about the explorations that have contributed to discovering our development as a species. In De Profundis we propose a look at this vital underwater world, with the presence of the Pristine Seas Project, the mission implemented by Enric Sala, which has become the most relevant of its kind for the Society at this time. In The Future at Stake we look towards space, but also at the challenges we have as a species to reverse the degradation of our natural environment, and finally, the Coexistence section shows other challenges that National Geographic also currently addresses, such as gender and racial diversity in our global society, the most relevant issues of the present. A window to the world. 130 years of NG opens the door to hope, hand in hand with a new generation of young scientists who represent the future of the National Geographic Society and research, most of which is focused on the preservation of our environment. They are the National Geographic Scholarship holders, scientists trained in very different fields whose work has been recognised by the Society for its special relevance and impact on the training of those who come after the great explorers, among which we may find Spanish researchers. Eight of them are currently developing missions both in our country and abroad, bearing witness to those who preceded them, a total of 50 Spanish explorers who have received this scholarship since the Society’s foundation. The exhibition could not ignore the different forms of communication that have contributed to making the National Geographic universe available to us all. 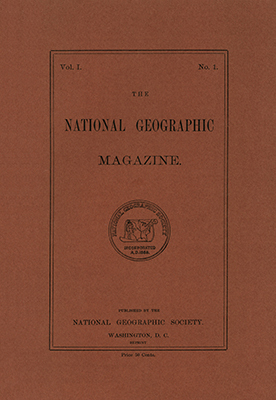 Of course, the NG magazine, the first issue of which was published in 1889. Its evolution in style and format is represented in the exhibition, including its Spanish edition, whose publication celebrated 20 years in 2017, edited by RBA editorial house. It includes the production of documentaries, an activity in which National Geographic debuted in 1965 when it followed the first American expedition to Everest, and has continued to grow in dissemination and presence with the global launch of the National Geographic and National Geographic Wild TV channels. Nowadays, these media are the main platforms which give voice to the activities of the Society, also multiplied by the impact of social networks, where National Geographic profiles are among the most followed in the world. The dream of the founders has flown much further than their first objective. The Society is celebrating its 130th anniversary and is in great health. Its activity continues at full capacity with an eye on the challenges of the present and future, without losing sight of the heritage of its legacy. FUNDACIÓN TELEFÓNICA complies with current legislation on personal data protection, users' privacy and the confidentiality and security of personal data, in particular, with the Regulation 2016/679 of the European Parliament and of the Council of 27 April 2016, and consequently adopts the necessary technical and organisational measures to prevent the loss, misuse, alteration, unauthorised access and theft of personal data provided to it, taking into account the latest technology, the nature of the data and the risks to which it is exposed. In accordance with current legislation, you are hereby notified of and agree to the processing of your data for the purpose described below. Reason for Processing: To manage subscriptions to newsletters, publications and magazines. Fundación Telefónica, as a non-profit organisation and in performance of its foundational purposes, will keep you informed of its current activity. Legal Basis: Consent of the user. Transfers: Data shall not be transferred to third parties. Rights:: The user has the right to withdraw his or her consent at any time, and to object to the processing of data, to access, rectify and delete data, as well as other rights, as explained under Additional Information. International Transfers: No international transfers of personal data shall be carried out. Rights: The user has the right to withdraw his or her consent at any time, and to object to the processing of data, to access, rectify and delete data, as well as other rights, as explained under Additional Information.